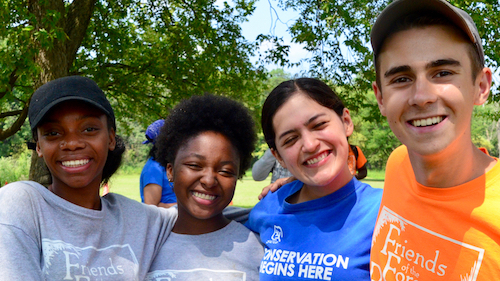 If there’s a common assessment of this summer that the Dan Ryan Woods Chicago Conservation Corps members all share, it’s that they got a lot done. “We got through seven turnpikes, a check step and three water bars, a lot of invasive species and did some seed collection,” crew leader Kailin Sepp said, proudly talking her experience with the crew, as she stood in the late morning sunshine at Ted Stone Preserve. Sepp and Thomas are SCA leaders who work in the Chicago Conservation Leadership Corps program (CCLC), a six-week summer conservation service-learning experience. CCLC crews perform ecological restoration and trail maintenance projects in the Forest Preserves of Cook County. On the morning of Aug. 10, the Dan Ryan crew (11 members, two leaders and one assistant crew leader) all gathered with the five other Chicago community crews to celebrate their accomplishments. The celebration took place under the pavilion at the Ted Stone Woods picnic grove in Hodgkins, Ill.
Arnold Randall, general superintendent of the Forest Preserves of Cook County, came out to recognize work of all six of this summer’s crews. In total, 265 teens participated. 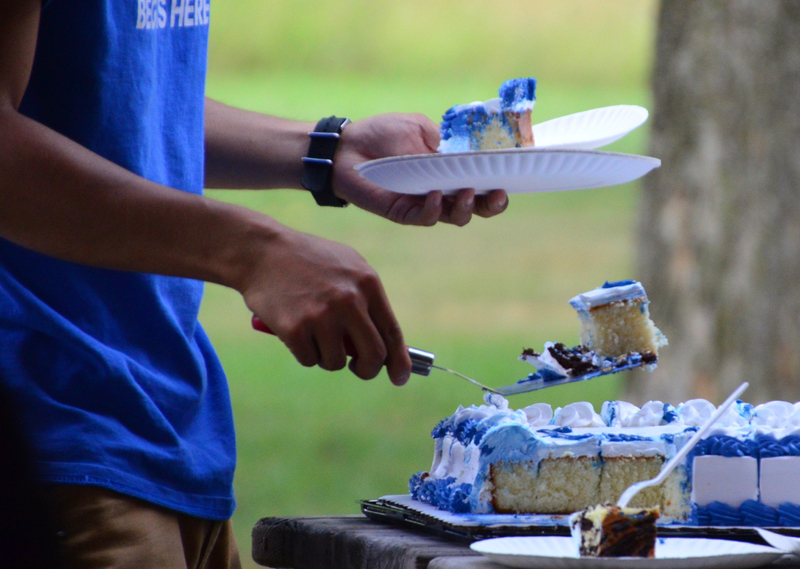 Before cutting into two large sheetcakes and spending time with their crews before heading in their many directions, the teens heard from program leaders. Daiva Gylys, Student Conservation Association Chicago Program Manager, and Zack Taylor, conservation director for Friends of the Forest Preserves, recognized each crew and handed out certificates and gifts. Thunderous applauded greeted the introduction of each crew. Dan Ryan crew members: Nylah, Gabrielle, Anely and Ethan. 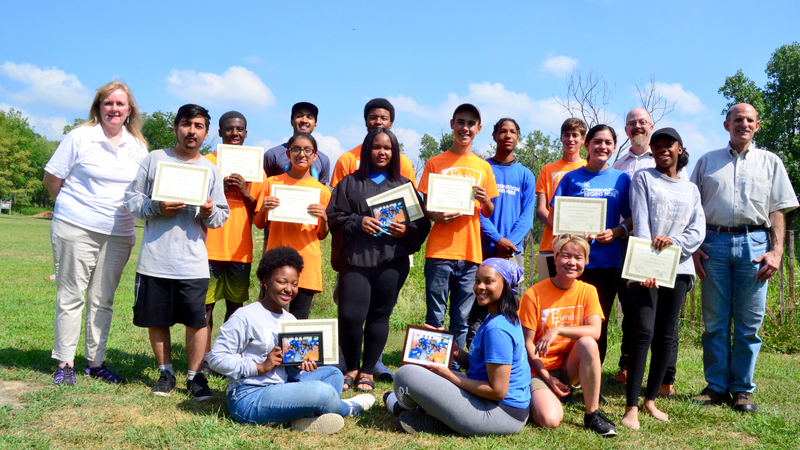 Through a grant from Harry and Jeanette Weinberg Foundation, Inc., the Forest Preserve Foundation underwrote the Dan Ryan crew, providing $50,000 for the six-week program. The Weinberg Foundation has a specific interest in supporting kids from the City of Chicago. The funds covered crew and leader wages, supply and training costs, risk management supplies, member transportation, evaluation and assessment, insurance and worker’s compensation. Working on turnpikes provided some challenges, Lopez said, because the logs they cut were never perfect when they tried to fit them into place. “So I learned how to problem solve with other crew members and how to figure out, although it takes sometimes 15-20 minutes, a way to make each turnpike fit in a proper way.” Turnpikes elevate the tread above adjacent wet (or seasonally wet) areas to protect wooded areas. Ethan Jorjorian finished his third summer as a Dan Ryan crew member. Heading into his senior year at Morgan Park Academy, Jorjorian, is looking toward continuing conservation work with the Preserves after college. He plans to major in environmental science. “No crew is ever the same,” which is another opportunity to learn from different people, he said. And that also gives him new ideas for how to do things. For first-time crew member Gabrielle Caldron, working in nature had lasting meaning, “especially being surrounded by people my age” as she learned about the importance of the Forest Preserves and biodiversity. “I signed up for this because it seemed like it would be really fun,” said the Kenwood Academy incoming senior. And it was that and more.